In the November 2017 election, Richmond City voters passed a school modernization referendum to change the city charter with an overwhelming majority. 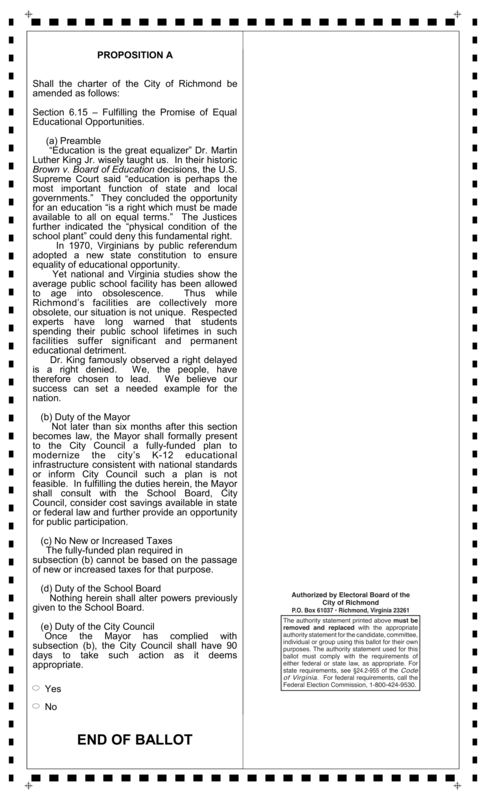 Following the election, Delegate Bourne and Senator Sturtevant agreed to patron the referendum in the General Assembly as the next step in the process; however, the bill Bourne introduced is not the same bill voted on by Richmond City voters as in Bourne's bill the requirement to not raise taxes was eliminated. Stepping outside of any opinions on whether taxes should be on or off the table, based on what I am reading in Title 15.2 of the Code of Virginia, I don't think it is legal for charter change legislation submitted to eliminate a provision that was included in the original. But, that could come down to what is the definition of "incorporate." The way I read this, a representative should not be able to remove parts of the referendum as passed by voters when they agree to introduce the legislation. It is a take it or leave it proposal. And if the bill is not introduced, then it does not move forward and goes back to the voters for public hearing. Because the referendum was not presented to the people without the language that prevents tax raises, I do not think it can be assumed that the people in Richmond are okay with taxes being part of the discussion for school funding. Even though I think the referendum was a political hit job with no real teeth, there is no way to hypothesize on if the referendum would have passed if it opened the door to taxes. Since the Code of Virginia is written in a way that indicates the people must be heard with regard to charter changes, removing a provision should not be allowed. I think in the spirit of the people's will, HB 1409 should be killed in committee and SB 750 should be carried through the legislative procedure. However, my opinion relies on interpreting the word "incorporating" as meaning every component of the referendum should be included in the legislation and there should be no alterations to the provisions voted on. Basically this comes down to the question: does the entire referendum need to be included in the legislation to uphold the Code of Virginia? If so, the legislation presented by Bourne is not in compliance with the Code of Virginia. I am not a lawyer, nor am I an expert in the Code of Virginia so I would love to hear others weigh in on this topic. But even in a world where "incorporate" is loosely defined to allow for this change, 71st District residents should really question why their Delegate takes it upon himself to make a change to what is intended to represent the clear will of the people. Bourne was quoted in the Richmond Times-Dispatch as saying, "To me, we would be in a better position if the mayor, City Council and School Board have as many options on the table as possible, I wouldn't want to handcuff the local government to explore all options to build these schools for our children." While we live in a representative government, that representation does not grant our legislators carte blanche authority to act in what they perceive our best interest to be. They still have to listen to the people they serve. To take on being the patron for legislation that is supposed to reflect the will of 85% of voters only to turn around and paternalistically remove a component of the legislation is not a good look for any elected official. In my opinion it is ESPECIALLY not a good look for an elected official who won the seat in a special election and then ran unopposed in the general election. I do not think winning a special election where ~5% of one's constituents voted grants a mandate to act with that level of unilateral authority on behalf of the people. ODD SIDE NOTE: Delegate Bagby is listed as a patron on HB 1409; however, at the Richmond Crusade for Delegates forum, he indicated he was not in favor of the referendum. At about 2 minutes and 40 seconds into a video from the forum, Bagby and moderator Johnny Walker have an exchange about the referendum. Basically, Bagby said that it is great to have a plan but the plan has to be a funded plan. Walker contends that is what the referendum does. They go back and forth a little bit before Bagby ultimately says he does not support the referendum. I would be curious to hear his logic on what exactly changed his mind for him agree to be a patron on HB 1409. Was it the removal of the language to not allow tax increases? Is a new revenue stream what he was trying to say without saying in his comments at the Crusade for Voters forum? Included below are screenshots of the wording for the House Bill, Senate Bill, and original referendum. You can track the bills at Virginia's Legislative Information System by searching for HB1409 and SB750.